Atleast 73% of Manny Pacquiao's fans shouts for Floyd Mayweather to be his next opponent. 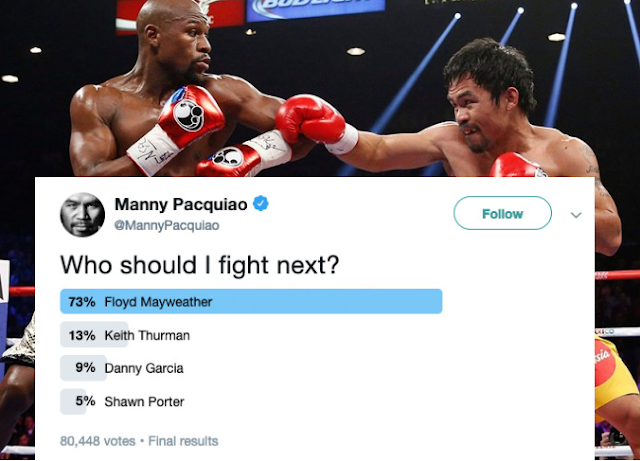 The result comes after an online poll set by the Philippine boxing legend Manny Pacquiao asking his fans who should be his next opponent. "Who should I fight next?" the eight-division champion asked in Twitter and his Facebook account, were Floyd Mayweather, Keith Thurman, Danny Garcia, and Shawn Porter are on the list. As a result seventy three percent out of 27,380 respondents would like to bring the fight with Manny and Floyd once more. Floyd Mayweather has retired for the first time in 2007 after he defeated British fighter Ricky Hatton. But he returned back to the ring after two years to face the counter puncher Juan Manuel Marquez, whom he dominated the ring in 2009. Well, if ever Floyd Mayweather will come out of retirement to face Pacquiao, for sure it's going to be a great battle. When they met in 2015, Pacquiao blamed a shoulder injury on his reduced punch rate were he was defeated in the world's richest prize fight. Pacquiao has 2.51 million followers on Twitter and 11.76 million on Facebook and they are all shouting for a rematch with Mayweather.